(Trent Nelson | The Salt Lake Tribune) Students from Brigham Young University are competing in a national advertising competition to change public perceptions of the much-maligned hot dog. Students from left are, Natalie Van Leeuwen, Amy Wilson, Sierra Breshears, Izzie Nelson, Nathan Blakely, Piper Alkonis, and Kailee Kunz, at Wienerschnitzel in Orem on Wednesday, March 27, 2019. Orem • Hot dogs are in crisis. Away from the ballpark and next to the hamburger — their flashier fast-food cousin — the frankfurter seems boring and unhealthy. What the link sausage needs now is a real-life Don Draper who can make the wiener a winner again. A team of advertising majors from Brigham Young University has accepted the challenge. And just like the fictional Sterling Cooper agency from the popular “Mad Men” television series — minus the booze and smokes — they have created a multimillion-dollar campaign to help make the hot dog top dog. The 12-member Provo team is among nearly 200 student groups nationwide that will present campaigns to judges as part of the 2019 National Student Advertising Competition (NSAC). The contest, sponsored by the American Advertising Federation, gives college students a chance to participate in a real-world case study that will help them find jobs after graduation. 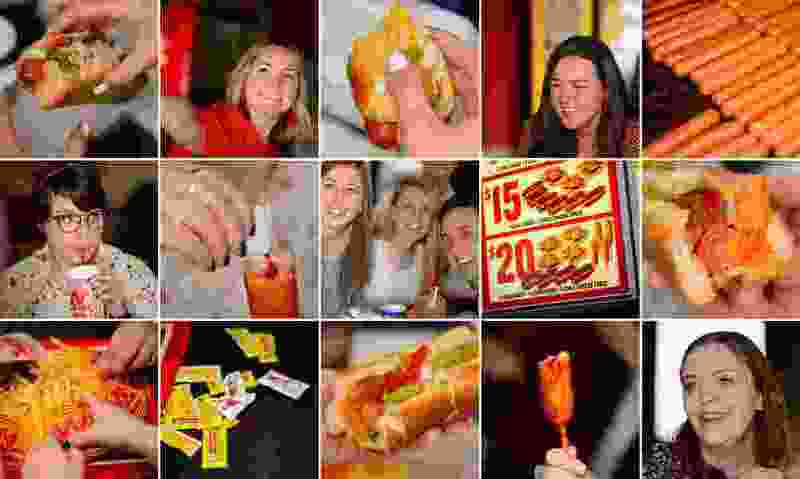 For this year’s contest, the world’s largest hot dog chain, Wienerschnitzel, challenged students to change public perception of the hot dog. Students conducted consumer focus groups and surveys. They used their research to develop an ad strategy and then put it into action through a yearlong campaign that includes a mix of television and radio spots, billboards and social media. The students even had an imaginary $25 million budget to work with, said Kevin Kelly, the BYU advertising professor who is overseeing Utah team. Kelly, along with team members, met with The Salt Lake Tribune at the Orem Wienerschnitzel to talk about the contest while wolfing down hot dogs with various toppings from sauerkraut to bacon. From blue pee to pink cubicles, fake mission calls to phony notices — April Fools’ Day is coming. It’s time to prank or be pranked. Is karaoke recreation? The answer could determine whether a Salt Lake City business gets a beer license. In previous years, students have helped promote products for large national brands, including Pizza Hut, Kellogg’s, Coca-Cola, Nissan, Yahoo and The New York Times. The students had their work cut out for them. Most Americans think hot dogs are made with slimy, low-budget meat trimmings and filled with sodium, fat and nitrates — which, if eaten often, cause health problems. Unlike the hot dogs of yesterday, he said, many varieties today are made from quality cuts of meat, including 100 percent beef or poultry. They also have lower sodium content. In some cases, “the hot dog is the same healthwise as a turkey sandwich,” added Nate Blakely. Nutrition experts may debate that fact. Wienerschnitzel’s original deluxe dog in a steamed bun — and topped with tomato slices, chopped white onions and a pickle spear — has 290 calories, 14 grams of fat and 11 grams of protein, according to the company’s online nutrition facts. Subway’s nutritional information shows its six-inch turkey sandwich on wheat bread has 250 calories, 3 grams of fat and 18 grams of protein. Not surprisingly, the BYU students had the negative image of the hot dog before the NSAC project. The students wouldn’t divulge details about their campaign. They did say that, in post-testing, people found their ads agreeable and their perceptions changed. “The competition shows how you can change the culture,” said Izzie Nelson. The teams had to submit their campaign books by the end of March. In April, they will travel to one of 15 regional competitions to sell their plan to judges. BYU will compete in Boulder, Colo., on April 27 against teams from Arizona, Colorado, New Mexico and Wyoming. If the Cougars win, they will move on to the semifinals in May and, if successful, possibly the finals in June. They have a shot. BYU is known for preparing students for the advertising world. Each year, the school’s AdLab, an agency housed within the College of Fine Arts and Communications, produces campaigns for national clients from Amazon to Nike and brings home numerous college-level awards. “We’re very successful placing students [in jobs] all over the country,” Kelly said. BYU’s highest NSAC finish was fifth, but it has won the regional competition several times, said Kelly, including last year, when students created campaigns for Ocean Spray. All 12 members of BYU’s NSAC troupe are juniors and had to compete against other AdLab students to make the squad. Philip Lamb, the general manager at the Orem Wienerschnitzel, hopes the students succeed, especially if the attention attracts a younger generation to his restaurant, which is frequented by older adults. “It’s great to have the exposure and for them to come up with new ideas,” he said, noting that hot dogs aren’t made like they use to be.